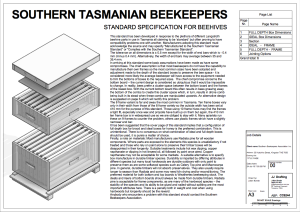 Southern Tasmanian Standard Hive Design | Southern Beekeepers Association Inc. This standard has been developed in response to the plethora of different Langstroth beehive parts in use in Tasmania all claiming to be ‘standard’ but often proving to have compatibility problems one with another. Manufacturers adopting this standard must acknowledge the source and may specify “Manufactured to the Southern Tasmanian Standard” or “Complies with the Southern Tasmanian Standard”. The tolerance on all dimensions is ± 0.5 mm except for the width of end bars which is – 0.4 mm (minus 0.4 mm). Alternatively, the width of end bars may average between 35 and 35.4 mm. In arriving at this standard some basic assumptions have been made as have some compromises. The chief assumption is that most beekeepers do not have the capability to manufacture their own frames so the most common sizes have been adopted and adjustment made to the depth of the standard boxes to preserve the bee space – it is considered more likely the average beekeeper will have access to the equipment needed to trim the bottoms of boxes to the required sizes. The chief compromise concerns the bottom board – the current design is considered so ubiquitous that it would be impossible to change. In reality, bees prefer a cluster space between the bottom board and the frames of the lowest box. With the current bottom board this often results in bees gnawing away the bottom of the combs to create this cluster space which, in turn, results in drone comb being built in its stead when these combs are manipulated upwards. An alternative design is suggested on page 6 which will rectify this problem. The 8 frame variant is far and away the most common in Tasmania. Ten frame boxes vary only in their width from those of the 8 frame variety so the outside width has been set at 410 mm for the purpose of this standard. Those using 10 frame hives may find the frames a tight fit, especially once wax and propolis have built up on them but again, the 410 mm ten frame box is in widespread use so we are obliged to stay with it. Many apiarists run these on 9 frames to counter the problem, others use plastic frames which have a slightly narrower end bar. It has been suggested that the cover page of this standard implies that a configuration of full depth box for brood and ideal boxes for honey is the preferred combination. This is unintentional. There is no consensus on what combination of ideal and full depth boxes should be used, it is purely a matter of choice. Finally, a note on materials: Most manufacturers use Radiata pine for all wooden components. Where parts are exposed to the elements this species is unsatisfactory if not treated and those who rely on paint alone to preserve their timber boxes will be disappointed in their longevity. Suitable treatments include hot wax dipping, copper napthanate or dipping in hot linseed oil, all followed by paint once aired. Copper napthanate may not be acceptable for some markets. A suitable alternative is to specify box manufacture in durable timber species. Durability is imparted by differing attributes in different species but many local hardwoods are durable outdoors with only paint to preserve them as are some softwood species such as Celery Top pine and Macrocarpa pine. In general, durable timbers will not absorb preservatives. They also usually require longer to season than Radiata and some may need kiln drying and/or reconditioning. The preferred material for both bottom and top boards is Weathertex beekeeping stock. The cleats and risers of bottom boards should always be made from durable timbers. Radiata pine is acceptable for frame components, as are many of the hardwood species – the stability of the species and its ability to be glued and nailed without splitting are the most important attributes here. There is a penalty both in weight and cost when using hardwoods but longevity should be the reward. 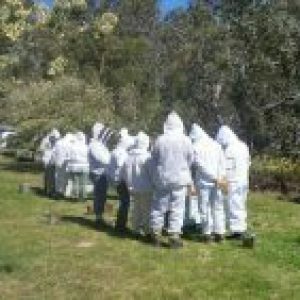 Anybody who encounters a problem with this standard should contact the Southern Beekeepers Association. ← Mead with a health boost!